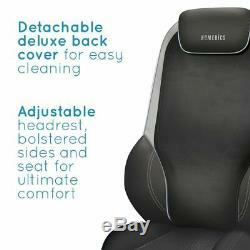 HoMedics Shiatsu Max 2.0 Back and Shoulder Massager with Heat Massage Chair. The ShiatsuMAX 2.0 Back and Shoulder Massager is the latest massage chair from the leaders in home massage, HoMedics. Designed with comfort in mind, treat the back and shoulders to some TLC, with a simple remote control and 14 massage programs to help you relax at home. Two double massages nodes for a deeper Shiatsu massage across the back and shoulders. 14 massage programs including Shiatsu and Rolling massage for full back massage. Adjustable height and width to customise your massage. Soothing heat option for muscle relief. 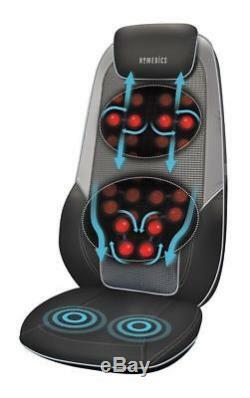 Invigorating vibration massage for upper legs/thighs. Adjustable headrest, bolstered sides and seat for ultimate comfort. For a Great Massage it's all About Shiatsu As the UKs leading brand in home massage products, HoMedics has decided to refresh a customer favourite in 2016. Theyve given the beloved ShiatsuMax a makeover. Boasting a new feel, a sleek design and a few new features to play with, the ShiatsuMax2 is set to replace its much loved predecessor. A new colour scheme in contemporary grey tones is the perfect match for latest interior designs. With plush materials and a luxury finish, the ShiatsuMax 2.0 will sit naturally into the modern home. Big or small, you can enjoy a relaxing massage that hits all the right spots. To make sure that happens, weve designed a flexible massage mechanism, so you can get the perfect fit. Using the simple controls, adjust the height and width of the massage reach. 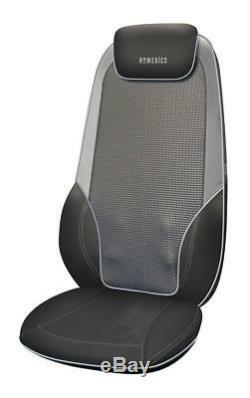 The headrest is adjustable too to ensure you're feeling fully rested by the end of your treatment. Theres a full demo at the touch of a button to show you exactly what the ShiatsuMax 2.0 has to offer. Then you can start mixing and matching up to 14 massage programs to perfect your favourite home massage chair treatment. For example, whilst enjoying a traditional Shiatsu massage, you can switch on the Shiatsu Spot mode to pause the travelling nodes to focus on one spot. Theres a good chance youll nod off but theres no chance of slipping off. The ShiatsuMax 2.0 fits comfortably to most home and office chairs. 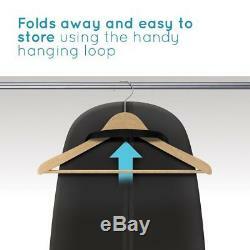 Simply slip the strap over the back of your chair, tighten and adjust to secure. Adding heat to a Shiatsu experience intensifies the massage technique by penetrating the warmth deeper into the muscles as they stretch and loosen stiff tendons. Youll love the feeling of spreading warmth across the back and shoulders as the massage nodes travel up and down the lumbar. This item has been classified as'New - Other' which means the outer packaging will show signs of transit damage and/or opening. Contents have been checked and in good order, classified as Grade-A Refurbished stock. This product has no reviews yet, however see what our buyers say about our other products..
View these items & similar. The item "HoMedics Shiatsu Max 2.0 Back and Shoulder Massager with Heat Massage Chair" is in sale since Monday, May 21, 2018. This item is in the category "Health & Beauty\Massage\Massagers". The seller is "fka-brands" and is located in Scunthorpe. This item can be shipped to United Kingdom, Antigua and barbuda, Austria, Belgium, Bulgaria, Croatia, Cyprus, Czech republic, Denmark, Estonia, Finland, France, Germany, Greece, Hungary, Ireland, Italy, Latvia, Lithuania, Luxembourg, Malta, Netherlands, Poland, Portugal, Romania, Slovakia, Slovenia, Spain, Sweden, Australia, United States, Canada, Japan, New Zealand, China, Israel, Hong Kong, Norway, Indonesia, Malaysia, Mexico, Singapore, South Korea, Switzerland, Taiwan, Thailand, Bangladesh, Belize, Bermuda, Bolivia, Barbados, Brunei darussalam, Cayman islands, Dominica, Ecuador, Egypt, Guernsey, Gibraltar, Guadeloupe, Grenada, French guiana, Iceland, Jersey, Jordan, Cambodia, Saint kitts and nevis, Saint lucia, Liechtenstein, Sri lanka, Macao, Monaco, Maldives, Montserrat, Martinique, Nicaragua, Oman, Pakistan, Paraguay, Reunion, Turks and caicos islands, Aruba, Saudi arabia, South africa, United arab emirates, Ukraine, Chile.